Francis signed up for a one year enlistment in a National Guard Field Artillery unit on 16 September 1940 but ended up volunteering for parachutist duty. After completion of jump school he was transferred to the 508th from the Hq 82nd A/B Div in Leicester, England on 5 August 1944. 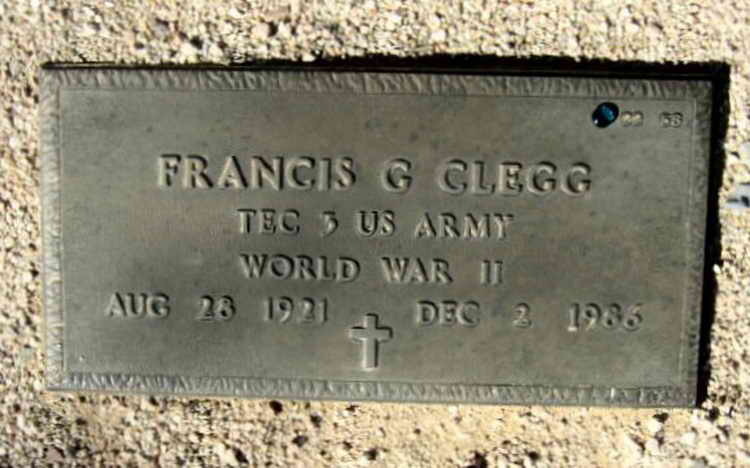 Tec.4 Clegg was wounded in action in Holland on 17 September 1944 and after a month in a field hospital was transferred to an unknown hospital, probably back in the U.S. He did not rejoin the regiment. It is noteworthy that he apparently received a promotion to Tec/3 before hs discharge. Francis, a native of New York, died on 2 December 1986 in Sun City (Maricopa), AZ.